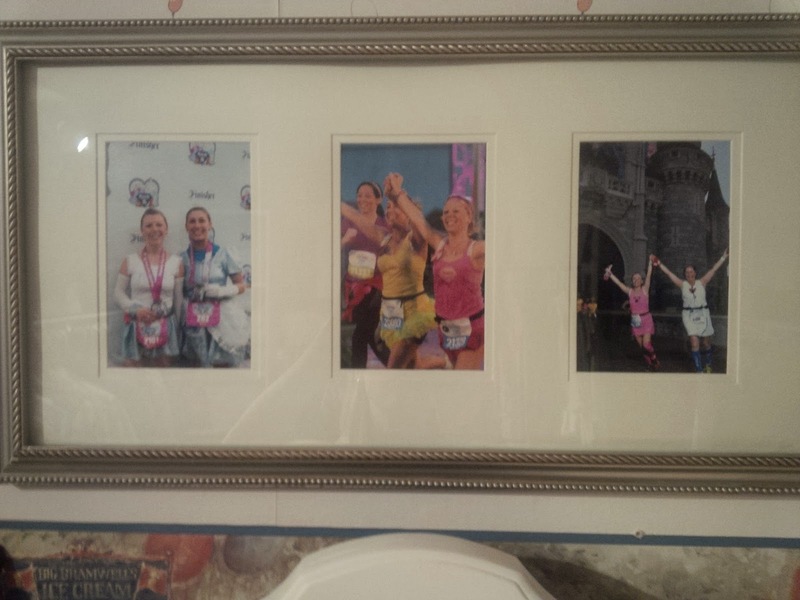 Fairytales and Fitness: My Race Wall. Is it too much? It looks great, you should show off all your hard work! I think I need to earn a few more medals before my wall starts looking like yours though! Thanks! This was all earned over several years. That is awesome how you show it all off! I wish I had enough space to do so because I so would. Right now it is all in a box sitting in my closet, not cool! I've found that there is never really enough space for everything but i've squeezed it all in. I have a small medal display from Allied and I've put my high school athletics plaque and lacrosse senior portrait next to it. It's not much but it's my sports wall. That sounds great Lesley. You should post a picture sometime. It looks great! You worked hard for all those medals so it makes sense to display them if you have the room. Thank you! It does make me happy to look at it. Your display looks fabulous! I'm already thinking about display ideas for the office in our new house. I can't wait to get to work on putting all of my and Preston's medals up! I can't wait to see what you end up doing at your new place. I LOVE IT! I need/want to get a display, but I don't have one, yet. Something to work on!! Thanks Rachel! 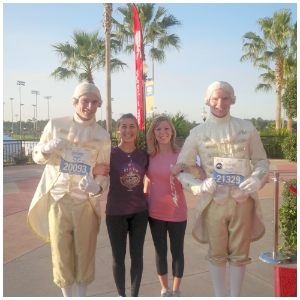 Gone for a Run has some really cute displays. 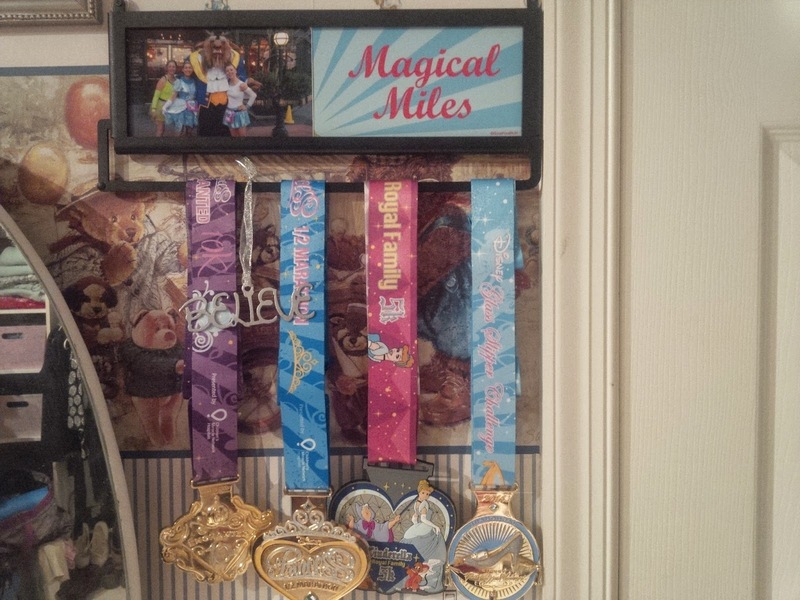 Oh, there are so many neat ideas out there as far as medal displays go. I can't wait to see how you spread them all out. I don't think it's too much at all - in fact, I LOVE it! 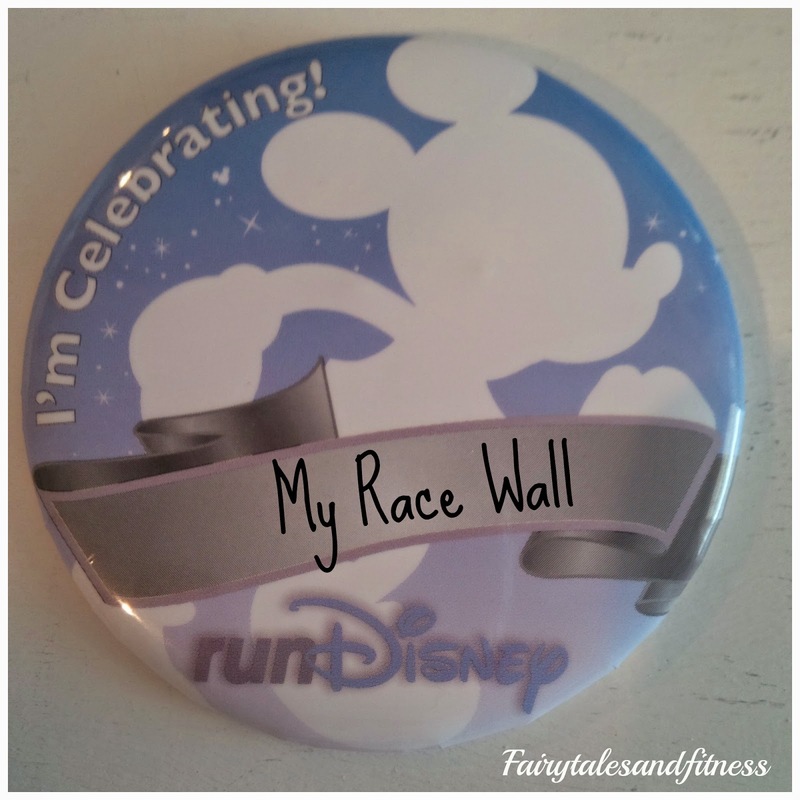 When we move to our new apartment this weekend, I am going to scout out a spot to make my 'race/medal shrine' and I promise to post pics! Yes, please do. I'd love to see pics of your displays ( and your new place). My original 5-hook medal holder has gotten kind of full, although I'm certainly not in YOUR league! I asked my father to make me a wooden one with a shelf on top, because I just did a half marathon and a 5k that each had glasses for all of the finishers, and I know I have two more races later this year that will also have glasses, and I wanted some way to display them. I think I might use the original holder for 5k medals (since there aren't many of those, and probably won't be) and move my halfs to the new holder, when I get it, since I'm hoping there will be LOTS of those! Haha, those medals have been earned over several years, you'll get there! The shelf is a wonderful idea. I wish I could fit a shelf up here somewhere. Wow, you did a great job!! I have all my medals but my Boston one in a box in my closet, maybe I should do something a little more creative with them!! I've seen some really cool hooks/displays for Boston medals. Did you get one of those? Thank you! That's what it reminds me of! Never too much. Hang those babies... even if its off the ceiling! Hmm, maybe you can hang then from the ceiling fan! 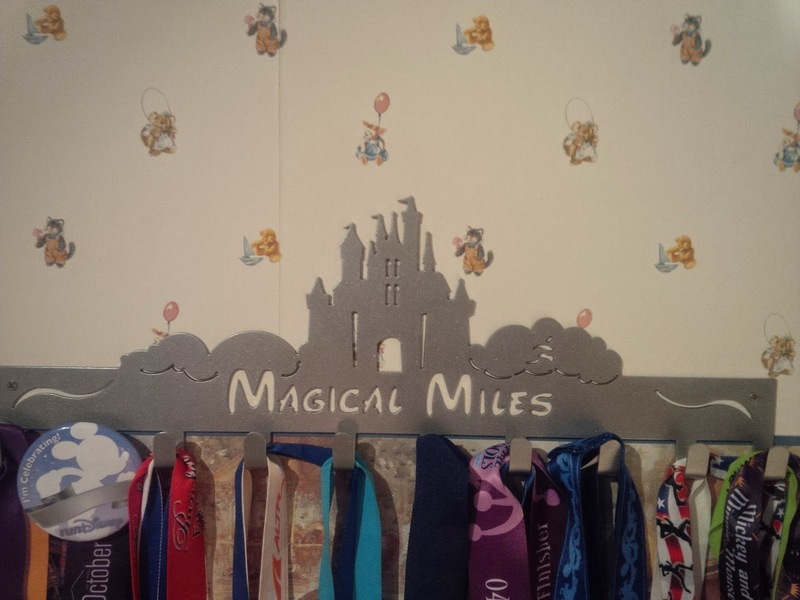 My sister also uses one of the over the door robe hook racks too (maybe it's the same one) because she has a lot of medals too. 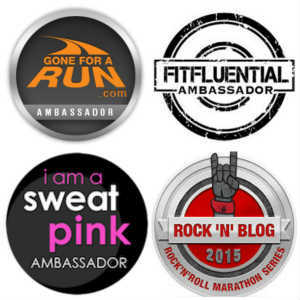 What you did for your bibs sounds like a good idea. Wow that's a lot of medals!!! Sadly, my medals are all hanging on a single hook on the inside of my closet. I never get them out! At least they are hung AND they are on the outside of your closet, not the inside. That's a start! I would love to see your wall! Okay...I just posted about mine! Perfect! I'll go check it out! I love it! Since you are really the only one to see it, just enjoy it! I love it! I have started my own wall too and I am proud of it- not many people see it but it makes me smile! I love it and think it looks great!! 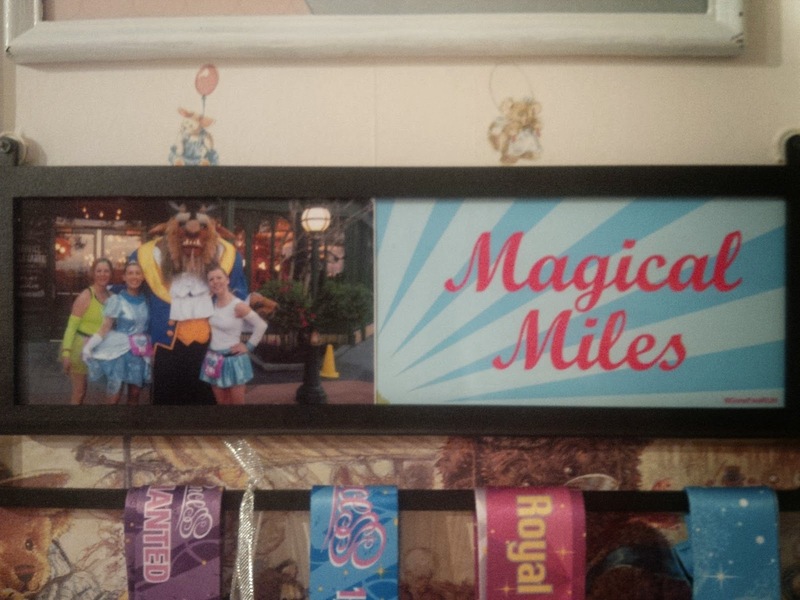 Your medal hangers are adorable and your photo frames add the right amount of dimension - It's perfect! !